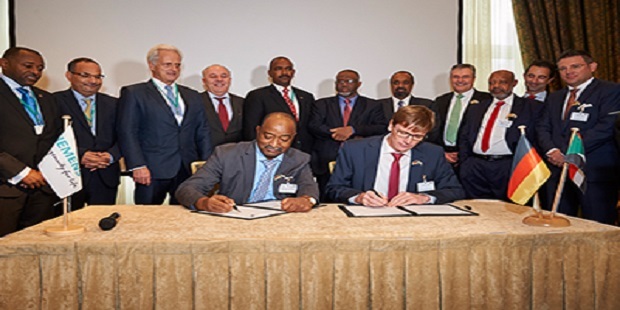 The agreement was signed in Berlin December 1, 2016, with the country’s state-power utility Sudanese Thermal Power Generating Company (STPGC) to supply five SGT5-2000E gas turbines. These machines will deliver a combined electrical generating capacity of some 850 megawatts for the Sudanese national grid. In addition to the five E-class gas turbines, Siemens’ scope of supply also comprises five associated SGen5-100A generators as well as Siemens’ SPPA-T3000 control systems. Three of the machines are destined for Garri Power Station in the North of the Sudanese Capital Khartoum, while the remaining two units will generate electric power further east in Port Sudan on the country’s Red Sea coast. All five of these turbine-generator sets will be initially commissioned as simple-cycle gas-turbine power plant units. However, later add-on of steam turbines is planned to expand the units to combined cycle configurations.